1) This paper is a Nigerian Peer Review paper, which was presented at FIG Working Week 2013, 6-10 May, in Abuja, Nigeria. Like last month article, this paper highlights one of the challenges Nigerian surveyors are dealing with, namely the Nigerian property market. At the conference many papers highlighted the current challenges Nigerians surveyors are faced with. You can find the papers here. Key words: Macroeconomy, property, property market, residential, rents. The study of residential price dynamics and macro economic developments are important for virile economic and social policies formulation at both local and national scales. This paper revisits the interaction between the Nigerian macroeconomy and the operation of its residential property market using econometric analysis. By employing a larger sample and different data analysis approaches (pairwise correlations, cointegration, granger causality and vector autoregression) the objective is to provide further evidence on the extent to which the property market is integrated or linked to macroeconomy. Evidence suggests that macroeconomic variables (real gross domestic product, inflation, exchange and interest rates) have long term relationship with residential property rents in Nigeria. The results of the granger causality shows that both exchange and interest rates have useful information for predicting residential property rents over and above the past values of other macroeconomic variables. Aside, the result of the variance decomposition within the vector autoregressive model further confirmed that real GDP and Exchange rate combined forecast 31.4% of the variance in residential property rents. This study concludes that the response of the residential property market to macroeconomic shocks of interest rate, real GDP, and exchange rate implies a relatively slow adjustment of the property market to the ever changing macroeconomic events in Nigeria making long run equilibrium elusive. These findings are significant for the continued development of the Nigerian property market which is fraught with poor market information. Residential property is a dynamic commodity characterized by structural durability, spatial immobility and its physically modifiable nature. As a consumption and investment commodity, residential property exerts profound influence on the socio-economic and psychological well-being of individuals, households and socio-ethnic groups. Since residential property constitutes the bulk of any country’s tangible capital, the study of residential price dynamics and macro economic developments are important for economic and social policies formulation on both local and national scales. Numerous theoretical and econometric studies have however investigated the relationship between residential price (which has remained a significant feature of most markets for housing services in the world) and the economy (for example, see Barras and Ferguson, 1985, 1987a & 1987b; Hekman, 1985; Kling and McCue, 1987& 1991; DiPasquale and Wheaton, 1996). Aside investigating the link between property and the wider economy, a point of convergence in these previous literature, is the existence of interaction and interdependency between property and the economy. For instance, during periods of macroeconomic stability, cycles in property tend to be endogenous (caused by disequilibria in the sector) and are relatively subdued and in periods of macroeconomic instability, property cycles tend to be exogenous (caused by various conditions in the macroeconomy) and sometimes feature exceptional fluctuations (Dehesh and Pugh, 1995 p.2581). Although this cause and feedback mechanisms described by Dehesh and Pugh (1995)is a feature of most market based system, the focal point of this research however is not on endogenous influences, but rather the nexus between real estate and exogenous influences of the economy. Earlier studies of this nature provided evidence on the link between property and the exogenous factors of the economy but have been considerably skewed to only the United kingdom and United States (McCue and Kling, 1994; Brooks and Tsolasco, 1999; Ling and Naranjo, 2003) with both countries having well integrated and transparent property markets. In developing countries, such evidence is limited to India (Joshi, 2006; Vishwakarma and French, 2010). In Nigeria, recent study by Ojetunde et al. (2011) has empirically discountenance the assumption that the residential property market in Nigeria is not coupled or linked with the economy. This research revisit the interaction between the economy and the operation of the residential property market by extending the study period (between 1984 and 2011) and improving on the data analysis approaches in Ojetunde et al. (2011) study. Unlike studies in developed economies which employed data on paper-backed securities, this study explore the use of nominal rents from direct property investment in the absence of property returns from the Nigerian Stock Market. Unlike other highly durable goods, the market for property and by extension, the operation of residential property presents a somewhat peculiar complexity as it comprises three (3) independent but connected markets linked to the economy. Fig.1 provides for a simple residential property model and link it with other exogenous systems (local and national economies and the capital markets). To start with, the model shows three important components (space, asset and development markets) which on their own represent market arenas where trade take place and prices are determined through demand and supply interplay ( Keogh 1994; Fischer 1999 and Geltner et al., 2007). The space market involves the interaction of the demand by residential property users with the current stock of space made available by the landlords. It is this result of demand-supply interaction which predicts the pattern of rents and the level of occupancy with vacancy clearing the market. Within the space market, the demand for residential space is aptly affected by the national and local economies. A growth in real wages for example may encourage new households’ formation and hence an increase in demand for residential physical space. For instance, property rights can be packaged in the short run in form of use rights to property users in return for residential rents (use values). In the asset market, Viezer, (1999) concludes that the rent determined in the space market is central in determining the demand for real estate assets because this cash flow in form of rents interacts with the cap rates required by investors, with the end product being the property market/ capital values. Development Markets with other Exogenous Systems. Source: Geltner et al.,(2007). As such what investors are really buying is the discounted present value of asset’s expected income flow. The cap rates which investors require in sealing real estate transactions in the asset market are affected by opportunity cost of capital (since the desirability of buying and selling real estate must be considered within a wide spectrum of other investment opportunities operating within the capital markets), growth expectation of future rents and investors perception of risk associated with real estate investment vis-à-vis other investment outlets in the capital markets (Ling and Archer, 1997b and Geltner et al., 2007). On one hand, clear independency however exists between space (use) and asset markets with respect to right to use space (user rights) as different from the right to hold a purely financial investment interest in property (investor rights). On the other hand, connectivity is evident as the use and investment rights subsisting in a property ownership (for instance in an unencumbered freehold interest) is mediated through the development market to meet changing market requirements of users and investors. It is these market changes in users and investors requirements which stimulate development activity and development in turns supplies new user and investors rights into the market (Keogh, 1994). For example, development would only occur insofar as property rent can offset the long run marginal cost of a property (Geltner et al., 2007). It is this singular condition which ensures that the development market employ physical and financial resources to construct new built space as well as refurbishment, rehabilitation or conversion of existing buildings. The role of development therefore comes to bear in differing ways: An economy in recession needs existing built space so as to continue to function. Conversely, structural changes in form of modifying existing dwellings (through refurbishment and conversion) and new construction of dwellings (resulting from outward expansion on undeveloped land) is necessary due to economic growth or structural shifts in the economy. Aside the foregoing simple property market model, numerous empirical studies by Barras, (1983); Barras and Ferguson, (1987a, 1987b) and Barras, (1994) have shown how building boom is triggered through the combinations of conditions in the real economy, credit economy and property market. The focal point of these studies is the derivation of a theoretical framework which has been tested using time-series modelling techniques to uncover the dynamics and operations within the property market. Exploring this theme with minor variant, Dehesh and Pugh (1995, p.2583) have also show considerable evidence that cycles in property has deep cause-consequence interdependency on the financial and credit cycles even at a global scale. They further argue that such structural change resulting from changes in the financial sector requirements may occur contemporaneously with and interact with the fluctuations in both the macroeconomy and the credit markets, thereby heightening inflation, causing financial collapse and leading to recession in the property sectors. Previous studies linking property to the economy over time, however, fall principally into two distinct categories: those that centre explicitly on property- backed securities such as real estate investment trusts (Hartzell et al., 1987; Chan et al., 1990; McCue and Kling, 1994; Brooks and Tsolacos, 1999; Ling and Naranjo, 1997; Ling and Naranjo, 2003) as against those on direct property market variables, as diverse as construction series and rents ( Kling and McCue, 1987 ; Kling and McCue, 1991 ; Giussani, et al., 1992). Table 1 summarizes previous empirical research linking property with the economy. These empirical investigations are preponderant in the USA with most employing vector autoregressive framework as their methodology and few using regression analysis. Within the first category, Chan et al. (1990) for instance examine the connection between some pre-specified macroeconomic variables and real estate returns from the stock market using regression analysis. They find that changes in risk, unexpected inflation and term structure are significant predictors; while changes in industrial production and expected inflation have no significant influence on real estate returns. McCue and Kling (1994) however extend the examination of the link between property and the economy in another direction. They treat real estate returns as a residual by controlling for the covariance between equity REIT returns and the overall stock market resulting from industry effects. In their analysis, the authors employ vector autoregressive model to test the relationships between this real estate residual and macroeconomic variables and conclude that macroeconomic variables account for 60% variance in real estate returns. Brooks and Tsolacos (1999) take a similar approach to McCue and Kling (1994) study by also removing the impact of the general stock market on equity REIT series but using UK dataset. They suggest that unexpected inflation and term structure have a contemporaneous rather than a lagged effect on property returns. The absence of lagged effect however implies that changes in unexpected inflation and term structure are quickly incorporated into property returns. The authors further contend that property returns are explained by own lagged values: current property returns may have predictive power for future property returns. They hypothesise that this own lagged effect is partly due to the fact that property returns may reflect property market influences (rents, yield and vacancy rates) rather than macroeconomic variables and partly because macroeconomic and property data are not in a direct measurable form. A departure from the above categorization is the studies by Kling and McCue (1987) and Kling and McCue (1991) who focus on property market indicator. They advocate the use of construction series from direct real estate investment and employ vector autoregressions to model industrial and office construction cycles. They find that macroeconomic variables influence real estate series indirectly through other macroeconomic variables. The authors also show that adjustment to macroeconomic shocks take place with a lag, resulting from the existence of long production period between new construction starts and completions. Giussani et al. (1992) also examine the relationship between changes in commercial rental values and fluctuations in economy activity using a predictive model. They analyse monthly data from 1983 to 1991 from Europe and find that real Gross Domestic Product (GDP) is the most significant explanatory variable for rental values. This result is consistent with those reported in Hetherington (1988) and Keogh (1994) that GDP is a determinant of rents, to the extent that rents are closely correlated with the business cycle. Table 1. Classification of Studies Linking Property with the Economy. Hoag (1980) USA Property specific variables, national and regional economic factors. Regression Analysis. Property specific variables, national and regional economic factors. Hartzell et al. (1987) USA Appraised values from real estate fund. VAR Expected and unexpected inflation. Chan et al. (1990) USA REITs and some pre-specified macroeconomic variables Regression Analysis Risk, unexpected inflation and term structure. Kling and McCue (1991, 1987) USA Construction series from direct real estate assets. VAR Output, nominal interest rates, money supply and employment. McCue and Kling (1994) USA REITs adjusted for stock influences and macroeconomic variables. VAR Nominal interest rates, price, output and investment. Lizieri and Satchell (1997a) USA REITs returns and equity returns adjusted for property influences. VAR Lagged values of the equity returns. Lizieri and Satchell (1997b) USA REITs returns and real interest rates. VAR Real interest rates. Ling and Naranjo (1997) USA REITs returns and macroeconomic variables. VAR Term structure, unexpected inflation, real treasury bill rate and growth in real capital consumption. Brooks and Tsolacos (1999) UK REITs adjusting for stock influences and macroeconomic variables VAR Unexpected inflation, term structure of interest rate. Ling and Naranjo (2003) USA Capital flows in present and past REITs returns and macroeconomic variables VAR Present and lagged REITs returns. Joshi (2006) India Housing share prices and interest rates and credit. VAR Interest rates and credit growth. and French (2010) India REITs and macroeconomic variables. VAR Term structure of interest rate. By using non- food credit as proxy for housing price in India, Joshi (2006) employs a structural vector autoregressive model for the period 2001 to 2005 and asserts that both credit growth and interest rate influence the housing market and stabilize other sectors of the economy. Vishwakarim and French (2010) also examine the influence of macroeconomic variables on the India real estate sector between 1996 and 2007. Using a structural break, they conclude that macro economic variables explain 10% of the variation in the real estate market between 1996 and 2000 with such variation increasing to 23% between 2000 and 2007. In Nigeria, Ojetunde et al. (2011) estimated a vector autoregressive model and suggest that macroeconomic shocks explain 28% of the variation in residential property rents. They further hypothesized that, responses of residential property rents to shocks in real GDP, exchange rates and short-term interest rates reflect the fact that rents from direct residential property and by extension, the market for residential property adjust slowly to changes in macroeconomic events. Their study however did not establish the presence of long run equilibrium between the Nigerian macroeconomy and its property market. This is one of the focal point of this research. The data were extracted from two distinct sources namely: the registered Estate Surveying and Valuation firms and the National Bureau of Statistics (NBS). The aggregation of residential rental price data was supplied by registered estate surveying and valuationfirms based on available letting evidence in most parts of Nigeria. National economic data as varied as Gross Domestic Product (GDP) in real terms, short-term interest rates, inflation and exchange rateswere provided by National Bureau of Statistics (NBS). Theirinclusion in the final analysis was premised on the assumption that trend in real estate returns is correlated with happenings within the real and credit economy. The sampledata in annual frequency covers the period 1984 to 2011 with a total of 28 observations. Table 2 reportsa summary of the descriptive statistics of the data sample. Table 2. Summary of Descriptive Statistics of Variables. Variable Name Description Mean Std. Dev. Min. Max. The methodology consists of four different approaches: pairwise correlation between the variables, Cointegration test, Granger causality tests(block exogeneity wald tests), and Vector autoregression (VAR). Cointegration and granger causality tests are within the vector autoregression framework employed in this research. The pairwise correlation examines the correlation between the residential rent and marco economic variables. A vector autoregressive (VAR) framework was employed for the period 1984 to 2011 in order to investigate the relationship between residential property market (using RESDRENT as proxy) and macroeconomic variables (INFLATN, EXCHAG, INTEREST, GDP). A vector autoregressive model is a systems regression model in which the variance or current values of the dependent variables can be explained in terms of the different combinations of their own lagged values and the lagged values of other variables as well as their uncorrelated error terms. Where = (RESDRENT, INFLATN, EXCHAG, INTEREST, GDP) is a vector of variables determined by k lags of all variables in the system, is a 5 × 1 vector of the stochastic error terms (impulses or innovations or shocks), is a 5 × 1 vector of constant term coefficients, are 5 × 5 matrices of coefficients on the ithlag of Y, while k represents the number of lags of each variable in each equation. Equation (1) which is a vector of 5 variables postulates for instance, that current RESDRENT is related to its own lag or past values, as well as the lag of the other four variables (INFLATN, EXCHAG, INTEREST, GDP). In other words, the information relevant to the prediction of the respective variables is contained exclusively in the time series data of these variables (Koop, 2000; Diebold, 2001; Gujarati, 2003). Following Lutkepohl (1991) information criteria technique was used to determine the appropriate length of the distributed lag. The values of multivariate versions of the information criteria are constructed for 0, 1,…..k lags (in this case, a maximum of 2) as seen in table 3 with the objective of choosing the number of lags that minimise the value of the five information criteria. *indicates lag order selection by criterion. Where LR denotes: sequential modified LR test statistic (each test at 5%level); FPE: Final prediction error; AIC: Akaike information criterion; SC: Schwarz information criterion and HQ: Hannan-Quinn information criterion. While LogL is thelog likelihood function. Analysis of this magnitude presumes the presence of stationary within the data series(Brooks, 2008).The examination of the inverse roots of the autoregressive polynomial (fig.2)however reveals that the absence of non- stationary in all VAR variables, since none of the roots has a modulus greater than one and none lies outside the unit circle. Fig.2: Inverse roots of the Autoregressive Polynomial. Johansen (1988) cointegration test is applied to the VAR variables to test the assumption that the five variables are bound by some long run phenomena, though the variables might deviate from their short run relationship. The trace and max tests for cointegration under the Johansen approach show whether the null hypothesis of no cointegration vectors should be rejected. Ganger casuality tests were also applied to the estimated VAR coefficients to determine the critical values of the block exogeneity wald tests of the null hypothesis, that collectively the coefficients of all the lags of a particular variable are simultaneously zero. The rejection of the null hypothesis on the basis of the block exogeneity tests suggests the variable(s) in the model which impact significantly on the future values of each of the variables in the system. However, causality tests only reveal the association among the variables and not whether variance or change in value of a particular variable has a positive or negative effect on other variables in the VAR system. Therefore variance decomposition and impulse response function (IRF) were estimated to examine the strength of such relationships within the VAR system. The estimated variance decomposition of RESDRENT, is the proportion of the variance in RESDRENT that can be explained by its own shocks and shocks to other variables. The forecast error variance (S.E) for an four (4) period forecast horizon within the estimated variance decomposition determines the proportion of RESDRENT for current and future periods (1, 2,3 and 4) which is accounted for by innovations to INFLATN, EXCHAG, INTEREST and GDP. It is expected that the total percentage of the forecast variance due to all innovations for each period sum up to 100. Impulse response function (IRF) is further generated for the estimated coefficients matrices in VAR model. The impulse response function traces out the response of RESDRENT in the VAR system to shocks in the error terms in equation (1) to the extent that, if in the RESDRENT equation increases by one standard deviation, such change or shock will change RESDRENT in the current and future periods. The pairwise correlations in Table 4 show two important results. First,residential property rents are strongly and positively correlated with real GDP and exchange rates fluctuations in Nigeria. Secondly, there are negative but weak correlations between residential property rents and short–term interest rates as well as between residential property rents and inflation rates. These results though a working hypothesis, are later confirmed in the Variance decomposition within the VAR framework later in this section. Table 4. Pairwise Correlations of Variables at Zero Lag. The Johansen cointegration test in Table 5shows the eigen value, statistic, critical value and probability value at 5% level of significance. By examining the trace test within the first two panels of the table, null hypothesis of four cointegrating vectors at 5% level is rejected as the trace statistics are greater than the critical values. The max test shown in the other panel confirms this result. On the basis of the granger causality test, it can be seen that with the exception of inflation other macro economic variables forecast RESDRENT. In this case all the lag coefficients of each of the macroeconomic variables are statistically significant (p-values are less than 5%) in the residential property rent equation, as indicated in the last panel of table 6. As a corollary, granger causality tests also show that while both the short -term interest rates and exchange rates have significant effects in the residential property rents, there is evidently ‘no reverse significant’ of residential property rents on these two macroeconomic variables ( their P Value are 0.2677 and 0.2838 respectively). 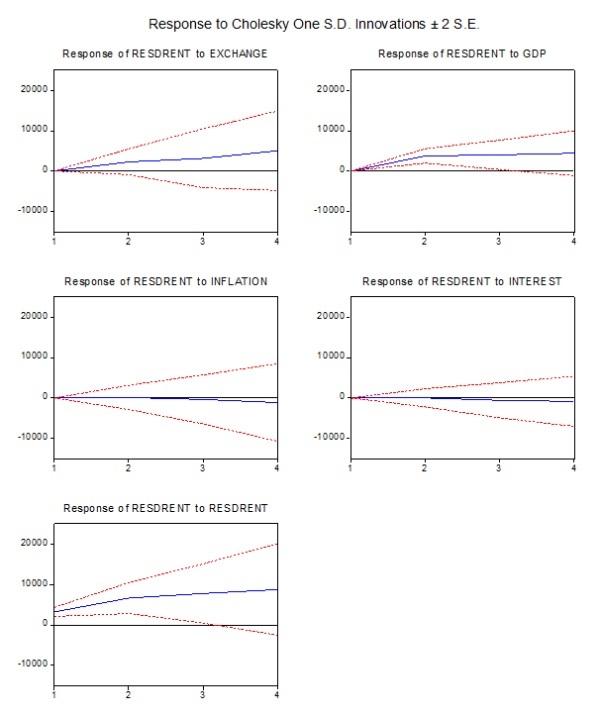 These results suggest that these two macroeconomic variables (short-term interest rate and exchange rate) ‘granger cause’ residential property rents and that these two macroeconomic variables have useful information for predicting residential property rents over and above the past values of other macroeconomic variables in the VAR model. Again, residential property rents and real GDP which are both significant imply the existence of feedback relationship between real GDP and residential property rents. The variance decomposition of residential rents to shocks or innovations in macroeconomic variables in Table 7 further confirms this result as it shows the contribution of each macroeconomic shock to residential property rents. Cholesky ordering: RESDRENT INFLATN EXCHAG INTEREST GDP. The forecast error variance (S.E) for four (4) years shows that real GPD and Exchange ratetogether forecast 31.4% of the variance in residential property rents. This result is consistent with those reported in earlier studies byKeogh (1994) that GDP predicts the pattern of rents and the findings of McCue and Kling, (1987); Kling and McCue, (1994) that short- term interest rates contributes to the variation in property returns performance. Finally, the Impulse Response Function (IRF) as depicted in fig. 3shows that shocks to short-term interest rates have a negative significant impact on residential property rents, with the shocks getting a bit pronounced afterperiod two. Shocks or innovations in inflation is negative but not significant and the shocks die away instantly even at year zero. Increase in real GDP and exchange rates have significant positive effects on residential rents. In this case, rents appear to settle down quickly to a steady rising state after period onedue to shocks of exchange rate and in the second period year to shocks of real GDP. Revisiting the interaction between the Nigerian property market and the macroeconomy has further confirmed that the use of econometric analysis rather adhoc methodologies purged with simple trend interpolations is plausible. Since residential property rent is a significant feature of most property market in the world, empirical evidence based on this study from Nigeria implies that exogenous influences of the economy (real GDP and Exchange rate) account for 31.4% of the variation within the residential property market. At a disaggregate level, real GDP accounts for a substantial proportion (17.3%) of this variation in the residential property market, while exchange rate account for the remaining 14.1% of these residential property market variance. In addition the feedback mechanism between GDP and residential property rents, means that these two variables are determined contemporaneously and by implication depicts a somewhat limited integration of the Nigerian residential property market with the economy. The one to two period(s) response shocks of interest rate, real GDP, and exchange rate show a relatively slow adjustment of the market to the ever changing macroeconomic events in Nigeria. Such responses are exogenous and make long run equilibrium within the residential property market almost elusive. The existence of such analysis of this nature will in the end aid useful property market analysis in a market fraught with poor property market data. Fig.3. Responses of Residential Property Rent to Shocks in MacroeconomicVariables. Barras, R. (1983). A simple theoretical model of the office development cycle. Environment and Planning A, 15, pp.1381-1394. Property Research, 11, pp. 183–197. Barras, R., and Ferguson, D. (1985). A spectral analysis of building cycles in Britain. Environment and Planning A, 17, pp.1369-1391. results. Environment and Planning A, 19, pp. 493–520. Brooks, C. (2008). Introductory econometrics for finance. 2nd ed. New York: Cambridge University Press. Brooks, C., and Tsolacos, S. (1999). The impact of economic and financial factors on UK property performance. Journal of Property Research, 16(2), pp. 139–152. evidence from equity REITs. American Real Estate and Urban Economics Association Journal, 18, pp. 431-452. Diebold, F.X. (2001). Elements of forecasting. 2nd ed. South Western Publishing. Jersey: Prentice-Hall, Inc. Englewood Cliffs. analysis and investments, 2nd ed.Thomson South-Western. Giussani, B., Hsai, M. & Tsolacos, S. (1992). A comparative analysis of the major determinants of office rental values in Europe.Journal of Property Valuation and Investment, 11(2), pp.157–173. Hartzell, D., Hekman, J.S. & Miles, M.E. (1987). Real estate returns and inflation. American Real Estate and Urban Economics Association Journal, 15(1), pp. 617-637. Hekman, J.S. (1985). Rental price adjustment and investment in the office market. American Real Estate and Urban Economics Association Journal, 13(1), pp. 32-47.
eds.Property investment theory, UK: Spon. Hoag, J.W. (1980). Towards indices of real estate value and return. Journal of Finance, 35(2), pp 569-580. Joshi, H. (2006). Identifying asset price bubbles in the housing market in India- preliminary evidence. Reserve Bank of India Occasional Papers 27, pp. 73–88. Keogh,G. (1994). Use and investment markets in British real estate. Journal of Property Valuation and Investment, 12(4), pp 58-72. Kling, J.L., and McCue, T.E. (1987). Office building investment and the macroeconomy: empirical evidence, 1973-1985. American Real Estate and Urban Economics Association Journal, 15(3), pp.234-255. Kling, J.L., and McCue, T.E. (1991). Stylized facts about industrial property construction. Journal of Real Estate Research, 6(3), pp.293-304. Koop, G. (2000). Analysis of economic data. New York: John Wiley and Sons. Ling, D., and Naranjo, A. (1997). Economic risk factors and commercial real estate returns, Journal of Real Estate Finance and Economics, 14(3), pp. 283-307. Ling, D., and Naranjo, A. (2003). The dynamics of REIT capital flows and returns, Real Estate Economics, 31, pp. 405–434. Lizieri, C., and Satchell, S. (1997a) Interactions between property and equity markets: an investigation of linkages in the UK 1972-1992. Journal of Real Estate Finance and Economics, 15(1), pp.11-26. Lizieri, C., and Satchell, S. (1997b) Property company performance and real interest rates: a regime switching approach. Journal of Property Research, 15, pp. 85-97. Lutkepoh, H. (1991)Introduction to Multiple Time Series Analysis, New York: Springer-Verlag. Estate Research 9(3), pp. 277-287. Ojetunde, I., Popoola, N.I., and Kemiki, O.A. (2011). On the interaction between the Nigerian residential property market and the macroecconomy. Journal of Geography,Environment and Planning, 7(2), University of Adoekiti, Nigeria. Stiglitz, J. (1994). The role of the state in financial markets. In: M. Bruno and R. Pleskovic, eds. Proceedings of the World Bank Annual Conference on Development Economics 1993, pp. 19–56. Washington, DC: World Bank. Viezer, T.W.(1999). Econometric integration of real estate’s space and capital markets. Journal of Real Estate Research, 18(3). Vishwakarma, V.K., and French, J.J. (2010). Dynamic linkages among macroeconomic factors and returns on the Indian real estate sector. International Research Journal of Finance and Economics, 43.